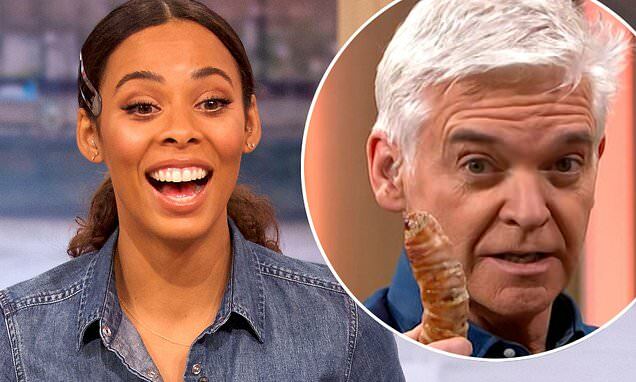 Rochelle Humes couldn't stifle her giggles as Phillip Schofield tested out Marks and Spencer's 'love sausage' during a Valentine's segment on This Morning. Leading the suggestive comments, the food expert described the item as a 'lovely big Cumberland sausage wrapped in bacon', which was shortly followed by an outburst of laughter from the hosts. The guest who was introducing the different types of Valentine's presents and food ideas added that M&S were urging social media users to tweet '#lovesausage'. Phillip appeared keen to try the meaty treat, and held the sausage up to his face and said 'Happy Valentine's Day! I'll wait for the memes'. Marks and Spencer have released the heart-shaped sausage in aid of Valentine's Day, hoping couple's will treat themselves to the supposedly romantic dish. Fans went wild for their hilarious exchange, as they took to Twitter to comment on the back-and-forth between the pair as they tested out the sausage.